When I was a student in high school I got a job at our local hospital kitchen cafeteria. The beginning of our shifts started at on the belt line preparing trays to take up to the floors of the hospital for the patients. I happen to be on the Tea/Coffee Station and ended up pouring the boiling hot water on my hand instead of in the cup…OUCH!!! I remember the pain very well and ended up in the ER department with my hand in a bowl of ice water…not fun!!! I had to change the gauze every day but the pain seem to go on forever…I still have the nasty scar. 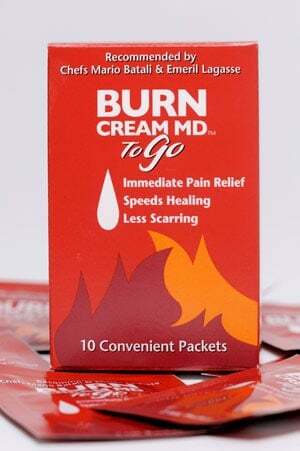 I wish I had had this Burn Cream MD back then. The reviews I read have been very positive. Burn Cream MD contains well known healing ingredients such as vitamin E, Arnica Montana flower extract, Chamomile flower Extract and Aloe. It is available at www.BurnCreamMD.com for $29.99 in a 2.5oz bottle. A great product to add to your medicine cabinet at home, work or anywhere. Joined the Simply Stacie Blog Frog Community. It has aloe in it. We used to have an aloe plant when I was a kid and we used it all the time. I learned that the company is based in New York and that Sara Moulton of the Food Network recommends it. I learned that burn cream md was created by a dermatoligist after she witnessed people getting burned in the kitchen of her family’s restaurant. A portion of their proceeds will be donated to the National Fallen Firefighters Foundation.